I´m a guitar player, producer and composer from Germany. I especially love Jazz and Brazilian Music. After graduating in Jazz Performance, Composition and Arrangment at the Universities of Performing Arts in Germany and New York, I went down to Rio de Janeiro in 2001 with my old fellow Kim Barth where we set up our first project Bossa Nova Legends. 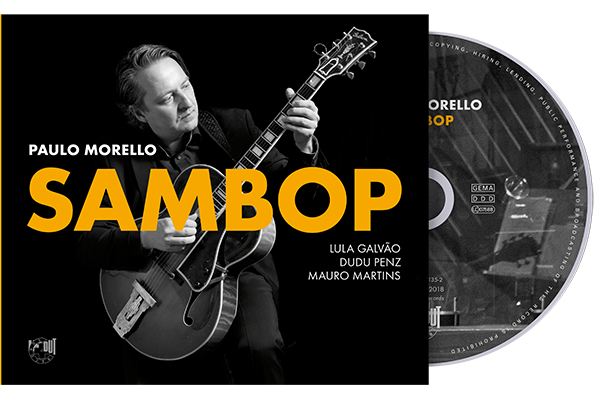 Together with the production of the CDs “Morello & Barth present Bossa Nova Legends”, we led a three year tour with legendary singers Johnny Alf, Leny Andrade and Pery Ribeiro, hitting the major Jazz festivals and Concert Halls in Europe and South America (Queen Elisabeth Hall, London; Teatro Rival, Rio de Janeiro; Verona Jazzfestival, Italy; etc.). The success of the Morello & Barth project earned me further production contracts and tours with Jimmy Smith, Larry Coryell, Roberta Gambarini, Viviane de Farias, Paul Kuhn, Ivan Lins, Philip Catherine, Greetje Kauffeld, Jimmy Woode, Bamberg Symphony Orchestra, WDR and ZDF to name a few. After getting the chance to play Jimmy Smiths last European Tour I really got infected with organ trios. Now I´m happy to have my own organ trio with the great Jermaine Landsberger on organ. Lately I`ve been busy finishing our “Night Of Jazz Guitars” CD with Larry Coryell and my old friends Helmut Kagerer and Andreas Dombert – the CD is out now on In & Out Records. Beside my work in production and performing, I both teach Jazz and Latin music at the University of Music of Nürnberg, Germany. Have fun!